What’s a local media company’s No. 1 job, whether it’s a newspaper company, a TV station or a radio station? Simple: Win the biggest audience, every day. You have to win audience to win advertising dollars. Winning the biggest audience is a clear, simple, results-based goal. In the TV and radio industries, they’re all about it, based on standardized measures of audience share. But in the newspaper industry, for far too long now, we’ve rarely held ourselves accountable for our audience results. Instead, we have been far more focused on a task-based goal: Report the news. Makes sense because, until around the turn of the 21st century, reporting the news was enough to guarantee us the largest audience of any local media channel. We didn’t have to think much about competing for audience, because our print audience every day was bigger than any other media outlet’s viewership or listenership. But as the world has gone digital, that’s all changed. Now there are digital screens in almost every hand and home, connected to an infinite supply of every conceivable kind of news, information, entertainment and knowledge. As a result, we are engaged in a fierce battle for attention. And we are now far out of first place. More like 15th to 20th, as I’ve described in an earlier post. In an advertising-based business model like ours, 15th is not a good place to be. The ad dollars will flow — are flowing — to the biggest audiences. And, through targeting, to the small subsets that match an advertiser’s requirements. The bigger the audience, the better the chance of winning advertising dollars. Hence the headline on this blog. P.T. Barnum, master of hyperbole, knew he had to put on a fabulous show every day to make sure people flowed through the gates and dollars poured into the cashbox. In today’s incredibly competitive media environment, we do, too. Who in our organizations is taking ownership of this responsibility? In our industry, the usual view is that our job is to get the news. And once we’ve done that as well as we can, our job is done — with extra points for great storytelling. I want to see our organizations be tasked with a much bigger assignment: Put on “the greatest show on earth.” And build it around the news. I’m not talking about diluting the definitions of honest, straightforward and aggressive reporting. I’m talking about doing more of that, and better, as part of the solution. I’m talking about putting the job of reporting the news into a frame of larger accountability, with more content of many kinds to make the show absolutely compelling every day. Editor, VP of audience, publisher — they all share this responsibility: Produce content throughout the day — every day — that no one can live without. We produce a daily show, and the goal is audience. Someone needs to be a ringmaster of sorts, responsible for generating an audience as big as the market. That someone needs to plan a show every day that will literally compel public attention through the content presented. How many days of nothing does it take before they quit reading? Way too many people have quit already or never even started, and they feel they’re getting along just fine. Try the exercise to the right. How many A’s did you find each day? Real A’s? How many A’s does it take to make a day’s product a must-see? I think at least two. More is much better. How many B’s can make up for no A’s? I’m not sure they can. Too much of what we produce is “duty” copy — things we’re supposed to cover, based on the time-worn definitions of journalism. Boring board meetings. Routine public or sports events. Cliched human interest stories where only the names have changed. Trouble is, the world doesn’t volunteer enough A’s to make papers and websites that no one can afford to miss. We need to take charge of the show, planning and producing A’s on a timetable that assures must-see papers and websites every day. How do we create A’s on schedule? We can do it with investigative journalism, but it would take a huge budget to do it every day. Here’s the good news: A’s don’t have to be just news stories. A’s can be anything that people will flock to see. The Topeka Capital-Journal attracted a million page views in a week or so with a slide show of the 50 most expensive houses in the market. The Conway Log Cabin Democrat drove 62,000 page views with a slide show of the people attending a high school graduation. A’s are any kind of content that will get people talking, whatever they will forward to their friends and post on Facebook, whatever is fun, fascinating, ridiculous, adorable, infuriating — the list goes on and on. A’s can be gossip, games, puzzles, social media “buzz,” tweets of the local rich and famous — the only limit is imagination. In every community, such things can be found every day. Even advertising can help, as I described here. 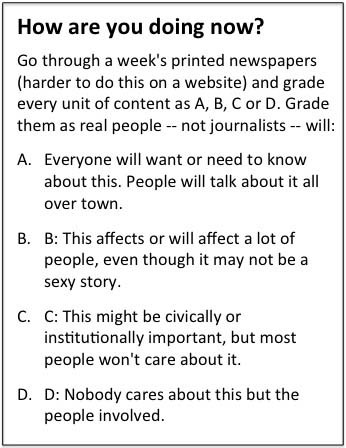 Not all of this can or should be done in newsrooms. We need to be moving resources around in the organization to get the whole job of daily audience creation done, by all necessary means. Producing a great show every day will take imagination and creativity. It will require redefining some positions. It will require producing A’s of many kinds. It will require creating and featuring types of content we’ve never done before, or considered important. And all right on schedule. But it can be done. But if we don’t start holding ourselves accountable to a higher standard — produce content every day that no one can live without — it won’t be. And we’ll go right on declining. Posted on July 15, 2013, in Audience, Content, Disruption, Media business model, Newsrooms and tagged accountability, audience, audience accountability, content, newsrooms, ringmaster, Vice President of audience, vp of audience. Bookmark the permalink. 4 Comments. Steve this is excellent. We have to constantly be challenging ourselves to present content that people are hungry for. When we produce the best content… people come in droves. When we don’t… they punish us with indifference.